On December 4, 2018, after more than 16years in extreme isolation, Mauricio Hernandez Norambuena, “Ramiro”,held hostage in Brazil’s prisons, is finally transferred out of thebrutal isolation to which he was subjected. Originally published by Publicacion Refractario. Translated by Anarchists Worldwide. 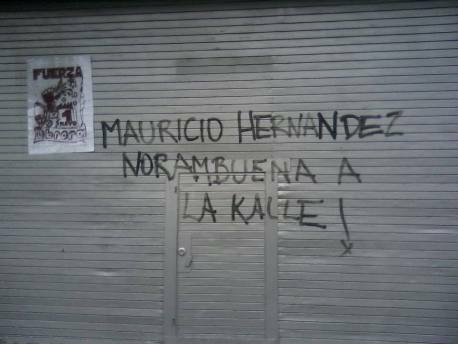 It is to be hoped that Mauricio will betransferred to a different prison with a “normal coexistence”within the jails. We know that this is a substantial change in dailylife of Mauricio and we are very happy for that, even so it isnecessary to continue agitating with all the possible differences butalso all the existing unions for the liberation of the non-repentantrevolutionaries. .
Against prisons in Brazil and Chile:Solidarity with the unrepentant revolutionaries! Publicacion Refractario, December 8, 2018. Previous post: Reportback #GiletsJaunes in #Nantes December 8: The people want the fall of the regime!